About That "Hastily Prepared Fiscal Blueprint"
This debt explosion has resulted not from big spending by the Democrats, but instead the Republican Party’s embrace, about three decades ago, of the insidious doctrine that deficits don’t matter if they result from tax cuts. In 1981, traditional Republicans supported tax cuts, matched by spending cuts, to offset the way inflation was pushing many taxpayers into higher brackets and to spur investment. The Reagan administration’s hastily prepared fiscal blueprint, however, was no match for the primordial forces — the welfare state and the warfare state — that drive the federal spending machine. The quote above is from William Greider's famous 1981 Atlantic article "The Education of David Stockman." Stockman later wrote a book about his experience in the Reagan White House, which was reviewed by Michael Kinsley for the Times. Update (8/6): Bruce Bartlett, who as a staffer for Congressman Jack Kemp also played a supporting role in the 1981 tax cuts, considers Stockman's "eclectic ideological journey." According to the BEA's advance estimate, the US economy continued to grow in the April-June quarter, but at a not-very-fast 2.4% annual rate. That's not fast enough to bring the unemployment rate down. Since output growth has been positive for a year now, we can't really say we're in a "recession," but with growth too slow to reduce unemployment, the word "expansion" doesn't really feel right. 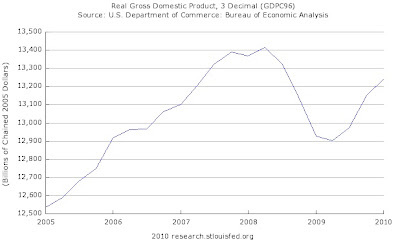 An informal term for this positive-but-slow growth state is "growth recession." While we shouldn't read too much into one quarter's (preliminary) data, it does raise the question of whether or not the "great recession" will be followed by the "great growth recession." On a more optimistic note, nonresidential fixed investment growth (i.e., the part of investment that is not houses or inventories) accelerated to a 17% rate. So businesses are adding equipment and software again... if only we could get them to hire workers, too! Consumption was sluggish - growing at a 1.6% rate as households continued to increase savings. 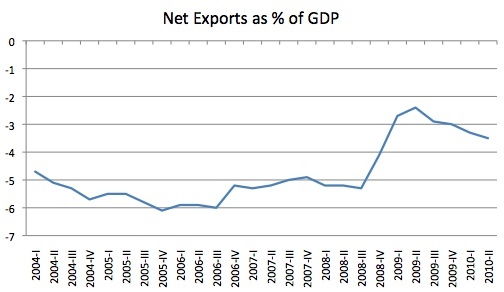 Net exports made a big negative contribution to the overall total - export growth of 10.3% was swamped by imports rising at a 28.8% rate. 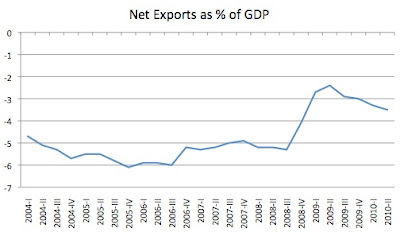 After decreasing sharply during the recession, the US trade deficit is headed back up: It remains to be seen how much of a "rebalancing" effect we'll ultimately get out of this slump. This suggests that the US hasn't entirely relinquished the "demander of last resort" role in the global economy, especially with Europe hobbling (ahem, Germany). The flight-to-safety spike in the dollar in 2008 did not help (in general, the effect of exchange rate movements on trade tends to occur with a significant lag). The BEA release also included revisions of past data which were downward for 2007, 2008 and 2009 (Calculated Risk has a useful picture). 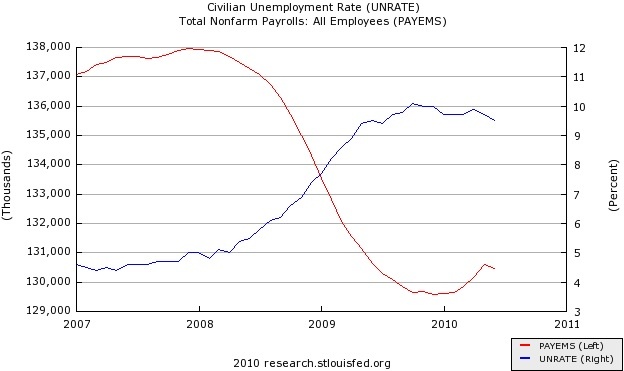 In that light, the horrific job numbers make more sense. 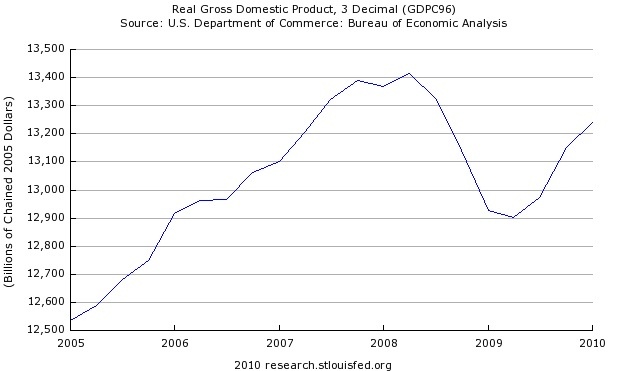 First quarter 2010 growth was revised upward from 2.7% to 3.7%. See also Catherine Rampell's Times story and reaction to the report from: James Hamilton, Free Exchange, Mark Thoma and RTE's Wall Street round up. Update (8/3): New inventory data give reason to expect a downward revision when the second estimate comes out Aug. 27. The chief task that John Maynard Keynes set himself in writing his General Theory of Employment, Interest, and Money was to uncover the deep axioms underlying the economic orthodoxy of his day, which assumed away the possibility of persistent mass unemployment. The question he asked of his opponents was: “What must they believe in order to claim that persistent mass unemployment is impossible, so that government ‘stimulus’ to raise the employment level could do no good?” In answering this question, Keynes reconstructed the orthodox theory – and then proceeded to demolish it. He goes on to provide a nice quick sketch of Keynes' critique of "classical" economic assumptions; the original argument, which is well worth reading today, is found in chapter 2 and chapter 12 of the General Theory. One of the lessons in international trade class is that tariffs on input goods harm upstream domestic industries - e.g, a tariff on steel would put domestic automakers at a disadvantage by raising their costs relative to foreign competitors. To account for this, economists use a measure known as the "effective rate of protection" which calculates the net effect from the tariffs on the final product that protect an industry and the input tariffs that harm it. The House of Representatives approved a bill on Wednesday to help U.S. manufacturers by suspending import duties on hundreds of raw materials they use to make finished goods. [I]n an article (available to all in its working paper version) appearing in the latest issue of the American Economic Review, Christian Broda and David Weinstein say the earlier estimates of the new goods/quality bias may be a bit understated. The authors examine prices from the AC Nielsen Homescan database and conclude that between 1996 and 2003, new and improved goods biased the CPI, on average, by about 0.8 percentage points per year. If this estimate is accurate, consumer price increases since last October would actually be around zero, or even slightly negative, once we account for the mismeasurement of the CPI caused by new and improved goods. But (oh, you just knew there was going to be a "but" in here, right?) the authors also point out that, because new goods are introduced procyclically, this bias tends to be larger during expansions and smaller during recessions. In other words, given the severity of the recession and the modest pace of the recovery, there may not be a whole lot of innovation going on right now in consumer goods. 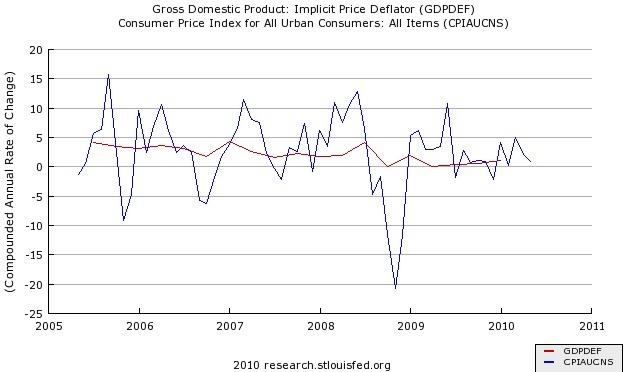 This is a bad thing for consumers, of course, but it would be a good thing for the accuracy of the CPI. Although deflation and the zero bound on nominal interest rates create a significant problem for those seeking to borrow, they impose an even greater burden on households and firms that had accumulated substantial debt before the onset of the deflation. This burden arises because, even if debtors are able to refinance their existing obligations at low nominal interest rates, with prices falling they must still repay the principal in dollars of increasing (perhaps rapidly increasing) real value. When William Jennings Bryan made his famous "cross of gold" speech in his 1896 presidential campaign, he was speaking on behalf of heavily mortgaged farmers whose debt burdens were growing ever larger in real terms, the result of a sustained deflation that followed America's post-Civil-War return to the gold standard. The financial distress of debtors can, in turn, increase the fragility of the nation's financial system--for example, by leading to a rapid increase in the share of bank loans that are delinquent or in default. Japan in recent years has certainly faced the problem of "debt-deflation"--the deflation-induced, ever-increasing real value of debts. Closer to home, massive financial problems, including defaults, bankruptcies, and bank failures, were endemic in America's worst encounter with deflation, in the years 1930-33--a period in which (as I mentioned) the U.S. price level fell about 10 percent per year. That's Ben Bernanke, in a speech titled "Deflation: Making Sure 'It' Doesn't Happen Here" given during our last deflation scare, in 2002. This one is far more serious because we have indeed reached the zero lower bound and are in recovering slowly from a severe recession. 1. Do we have a "determined government"? With Congress tied in political knots over whether to take further action to boost the economy, Fed leaders are weighing modest steps that could offer more support for economic activity at a time when their target for short-term interest rates is already near zero. They are still resistant to calls to pull out their big guns -- massive infusions of cash, such as those undertaken during the depths of the financial crisis -- but would reconsider if conditions worsen. 2. Would more aggressive Fed action really work? Perhaps, but the worry is that, while the Fed can create money, it can't force people to spend it. Mark Thoma says "Don't Expect Miracles from Monetary Policy" and Bruce Bartlett reminds us that any increase in money supply can be offset by a decline in money velocity. 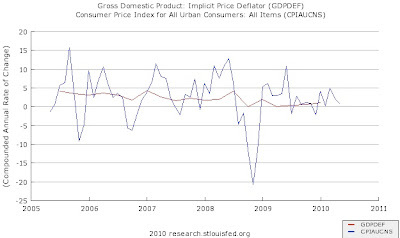 Update (7/11): From Paul Krugman, evidence on a trend toward deflation; see also his Times column. In today's Times, an amusing profile of the authors of "This Time is Different." The good news isn't so good - according to the BLS, the unemployment rate ticked down to 9.5% (from 9.7 in May), but that is an artifact of 652,000 people leaving the labor force. According to the household survey (from which the unemployment rate is calculated), the number of people employed fell by 301,000, and the labor force participation rate declined to 64.7%. That suggests that people may be so discouraged about their employment prospects that they are giving up (to be counted in the labor force, people must either be working or looking for work). The bad news isn't so bad - the decline in payroll employment of 125,000 (calculated from the separate establishment survey) was driven by a 208,000 decrease in government jobs, mostly due to the end of temporary census jobs. Private-sector payrolls increased by 83,000. But that's still not very good - its way far short of the pace needed to keep up with population growth and productivity increases, not to mention getting the massive number of unemployed people back to work. One would hope this would put an end to all the new austerity talk (discussed here by Paul Krugman) and create a sense of urgency about extending unemployment benefits and increasing aid to state and local governments. As David Leonhardt explained in his column last week, we are in danger of repeating the mistakes of 1937 - I doubt anybody understands this better than Ben Bernanke and Christina Romer. And yet, the White House appears to be putting a positive spin on things. The Times' Jackie Calmes reports that while the administration's economists want more stimulus, the political advisors are fretting about public deficit anxiety. Meanwhile, down the street, congressional Democrats have created a procedural obstacle to doing anything more next year, as Ezra Klein explains. More takes on the June report from David Leonhardt, Mark Thoma, Free Exchange and RTE's round-up from Wall Street "economists."